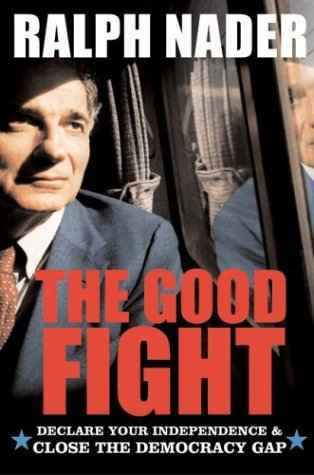 Click here for 11 full quotes from Ralph Nader in the book The Good Fight, by Ralph Nader. Economic powers control our lives and our elections. Capitalism can lead to fascism. Corporations should not legally be counted as individuals. Giant corporations roam the Earth making people into serfs. Corporations are commercializing the world of the child. Corporate activity destroys the third world. Democracy gap: people must claim power, or the greedy will. Giving information to people overcomes propaganda. Change requires a critical mass of the involved. Bush is turning the U.S. into a police state. The above quotations are from The Good Fight: Declare Your Independence and Close the Democracy Gap, by Ralph Nader.